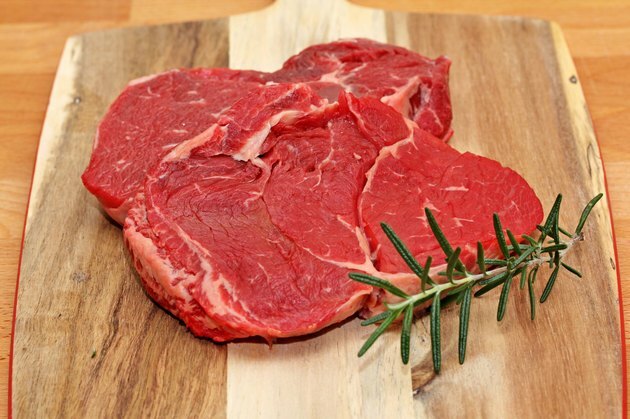 A Scotch fillet is the rib-eye cut of steak that lies under the ribs of the cow. This tender portion of meat is often attached to the ribs to create a standing rib roast, but when it is detached and sold separately, it is a tender and versatile cut of meat that can be grilled, broiled or sautéed. Scotch fillet is a flavorful cut of beef, and because it is already tender, it does not need to be marinated. Cook it plain or add a flavorful steak rub to accentuate the flavor of the beef. Take the Scotch fillets out of the refrigerator, and allow them to warm to room temperature. Allowing the meat to warm up helps prevent it from drying out on the grill. Brush the grill grates with olive oil with a cooking brush. Heat the grill to medium-high heat, or 400 degrees Fahrenheit. Rub the fillets with seasoning or a rub, and place them on the grill. Grill the steaks for four minutes on each side, for a rare steak, or five minutes on each side for a medium steak. The time needed to grill your steaks depends on their size and thickness. Take the fillets off the grill, and insert the meat thermometer into the center of each. They should register 115 degrees Fahrenheit for rare, 125 for medium-rare, 130 degrees for medium, 140 degrees for medium-well and 150 degrees for well-done. Allow the fillets to rest for 10 minutes before you serve them. The resting period allows the steaks to finish cooking and reabsorb the hot juices, which makes them more flavorful and tender. Take the steaks out of the refrigerator, and allow them to warm to room temperature. Rub the fillets with the steak seasoning or a rub. Place the fillets in a broiler plan and slide it under the broiler. Cook them for three minutes on each side for a rare steak, five minutes for a medium steak or seven minutes for a well-done steak. Take the fillets out of the broiler, and insert a meat thermometer into the center of each. They should register 115 degrees Fahrenheit for rare, 125 for medium-rare, 130 degrees for medium, 140 degrees for medium-well and 150 degrees for well-done. Allow the steaks to rest for 10 minutes before you serve them. Take the fillets out of the refrigerator, and allow them to warm to room temperature. Rub them with the steak seasoning or a rub. Pour 3 tbsp. olive oil into the skillet, and heat the oil over high heat. Add the steaks and cook them for five minutes, then turn them and cook them for three more minutes. The steaks are rare when pink juices begin to bead on the surface of the steaks. Take the fillets out of the skillet and insert a meat thermometer into the center of each. They should register 115 degrees Fahrenheit for rare, 125 for medium-rare, 130 degrees for medium, 140 degrees for medium-well and 150 degrees for well-done.